Hey everyone, I hope your having a good week. 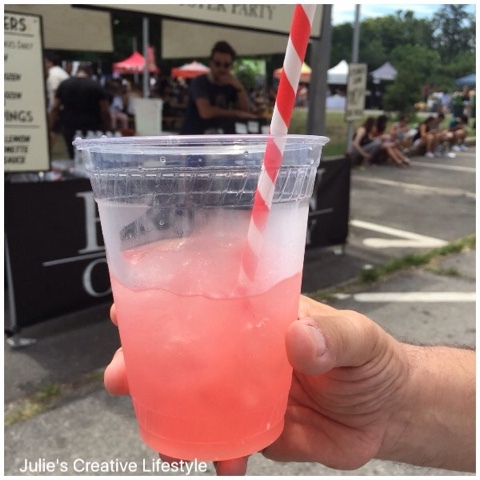 Over the summer I had the chance to go to Smorgasburg, and it did not disappoint! What is Smorgasburg you ask? Well it's a foodie lovers delight, featuring all kinds of foods, and over 100 vendors, held in two locations in Brooklyn, New York. We went to the Prospect Park location, on a hot summer day, and it was perfect for eating a variety of different foods. My husband, teen and friends, and I went to enjoy a day of some food fun. The many different food stands with people walking around to sample the food. 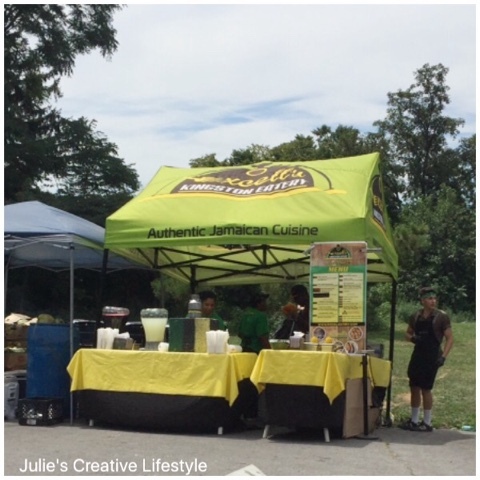 To see all of the food vendors, you can click HERE. My husband had a pink fruit drink to cool off with. Below is a ramen burger, which is all the rage right now. I had a bite of it and it tasted so good. The ramen burger is fried into a patty, and in between is the hamburger. The ramen is used as a bun for the burger. Ice cream, and egg creams. 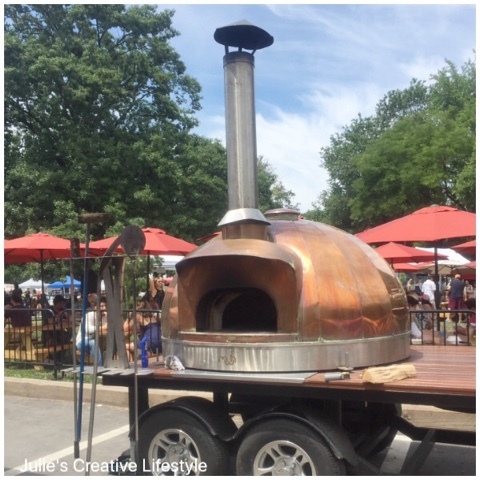 A large oven that I thought looked really interesting. 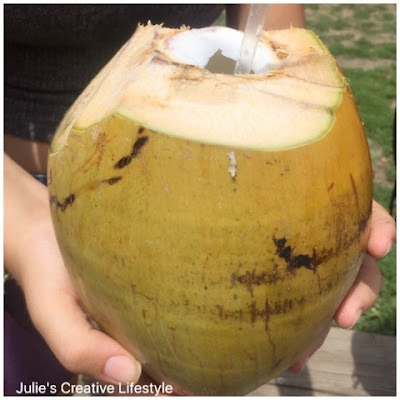 A fun tropical coconut drink, to cool off with made out of a coconut. We all had a great time trying out the different food stands, the drinks, and at the end, we could not leave without having ice cream! By the way, we went to the Prospect Park location, and my husband and I did not realize how huge the park is. We had a hard time finding the location of Smorgasburg, and then we got lost when we were leaving, on our way outside of the park, looking for our car and we had to take a cab to find it. 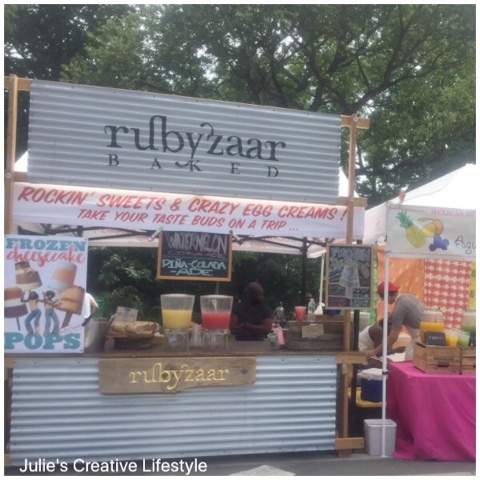 The next time we go to this food event we will go to the other location in Williamsburg, Brooklyn. The reason being is that it is not in a large park and in a location where you can't get lost. LOL! If you live in the New York area this is a fun food event you don't want to miss. I hope I've convinced you to try it out sometime. 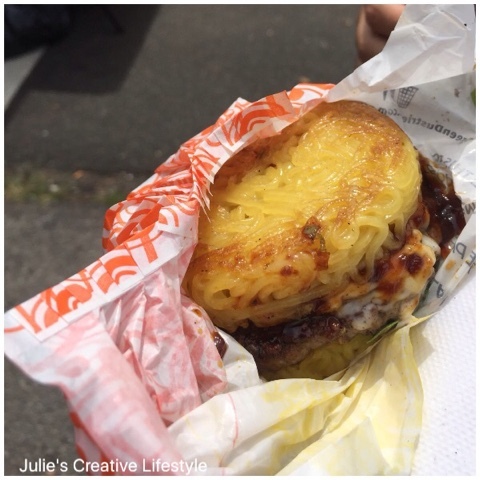 Thank you for sharing with us - I have never tried ramen burger and I would love to the first time I find it! 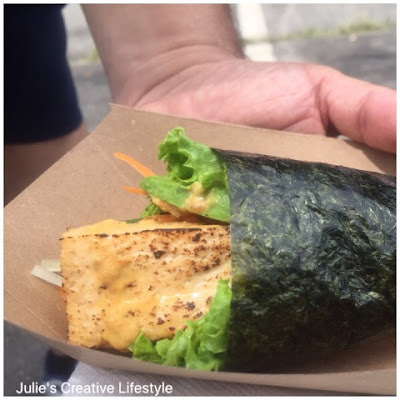 What a fun event, Julie! The ramen burger looks so tasty. We had a coconut drink on the beach in Kauai, but we put it down on a beach towel and the chickens attacked it!! That food looks so yummy. I admire your ability to navigate the NYC area and good for you taking a taxi to your car!! 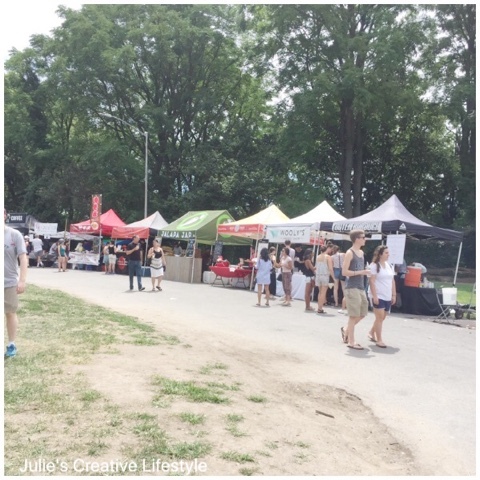 I can't believe I got to Smorgasburg before you did! :) I remember when we were there the Ramen Burger had just hit and the lines were ridiculous to get one! All of the food we had that day was amazing!! You're lucky you live close!! We went to the Williamsburg location. Julie, that sounds like a super day. You guys must have been stuffed! ;) I never realized that Prospect Park was that big. Good to know! Looks like a fun event, my friend. And I must say I have never heard of a ramen burger though it looks amazing! How fun is this place?!!! Love it. What a great fun variety of foods to enjoy. Oh my goodness, that looks like heaven! What a fun time and a great way to try new things! Hope you're having a great week too Julie! 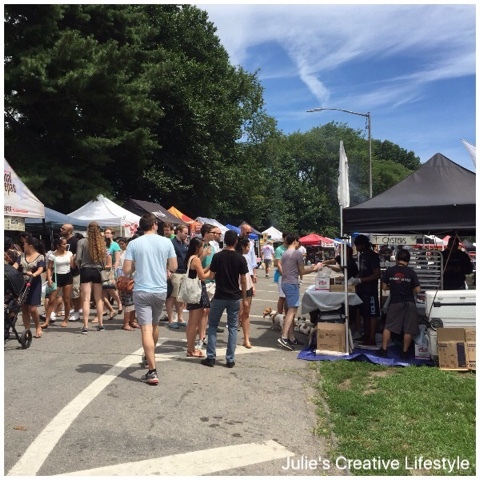 Looks like your day at Prospect Park was filled with lots of 'yummy' :). I love this idea! 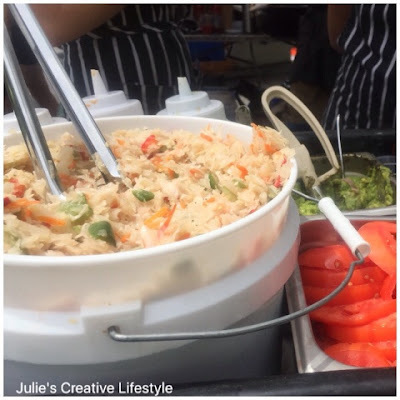 This is definitely something to try next time we are in NYC! Always looking for something new to do. Looks like fun thanks for sharing with Hearth and soul blog hop. Looks like a wonderful event, Julie! Thank you for sharing with us at Hearth and Soul!